There have been few startup manufacturers whose clubs have received as much attention and praise as the High Heat driver introduced last year by Knuth Golf. Golfers took to the High Heat at once with many finding it to be both longer and straighter than the major manufacturer’s driver they were playing. 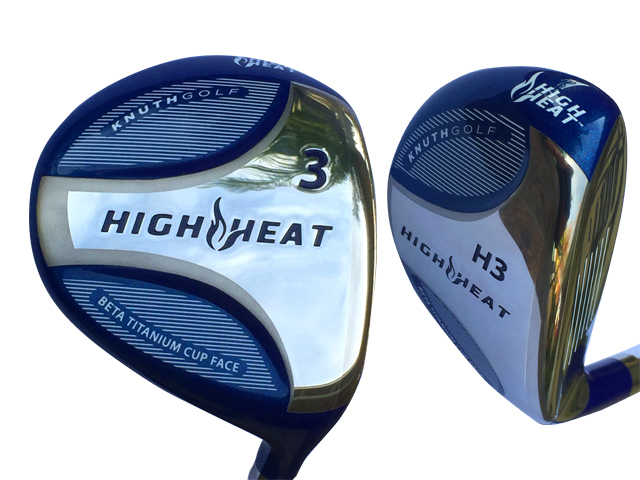 Creator Dean Knuth, a former Senior Director of the USGA, designed the High Heat specifically for amateurs by giving it the combination of a large sweet spot and high coefficient of restitution or COR. And according to Steve Trattner, Knuth Golf’s Executive Vice President, sales have been very strong. With this background in mind I was looking forward to my on-course testing of their newest clubs, the High Heat 3-wood and High Heat hybrid. In discussions with Knuth he pointed out the clubface of both is made from titanium, so in comparison to fairway woods and hybrids with a steel clubface, the cup face titanium construction has an immediate benefit. Titanium being lighter and stronger than steel produces a larger amount of face rebound at impact and that translates into something we all want…distance without added effort. Titanium in the clubface also helps preserve ball speed when contact is not in the center of the face which is another way of saying average players will find the High Heats forgiving. So, since most of us miss the sweet spot regularly this is an important feature. Overall the fairway woods are larger being 25% deeper and have a center of gravity that is 18% lower according to Knuth. He also explained the variable thickness face has seven zones with lobes near the toe and heel designed to increase the amount of trampoline effect. On the course it was immediately apparent the 15 degree loft 3-wood is a strong club. After two sessions on the range the first hole I actually put it in play was a sharp dogleg around water. The ideal tee shot would be a gentle draw of about 220-yards and the High Heat performed perfectly putting the ball exactly in the center of the short grass leaving it wedge distance to the pin. From the fairway the High Heat 3-wood gets the ball airborne from even suspect lies and did well from shorter length rough. In one instance the ball came to stop on the side of a sand-filled divot and, while I usually would not use a 3-wood from that kind of lie, I thought what-the-heck. Let’s see what happens. Without consciously making any changes to my swing to compensate for the lie (such as being sure to hit down), the ball came out easily with just a little drift from left to right. Entirely satisfactory. The 18 degree High Heat hybrid is a real beast and I particularly liked it from the tee on long par-3s because it gives the ball a nice high trajectory so it lands and stops unlike some other hybrids that roll out too much. In its primary job of getting the ball back into play or even onto the green from the rough it performed extremely well. The combination of a somewhat larger clubhead, a prominent sole rail and weight low in the clubhead meant it almost never met a lie it didn’t like…and couldn’t the ball out of. Both the woods and the hybrid have a mirror finish face and while it may not seem like a big deal and might even be considered merely cosmetic, but the finish shows the ball’s point of impact giving valuable feedback after each shot.